Garmin, the same manufacturer who probably made your first GPS unit that’s now collecting dust in the glove box of your car, also makes cameras. I didn't know this until I cruised the 360-degree video section of B&H Photo looking for something to replace my 2017 Samsung Gear 360 that I was not so happy with (note to Samsung: a stitch line that moves is a dealbreaker). There it was, sitting under a glass case, the Garmin VIRB 360. The camera had just launched. It had 5.7K video in a package smaller than my first and for $800. Much more expensive than the Gear 360 by about $640, but if it had extra resolution and stitch lines that didn't move, that was enough for me. The camera was so new that I couldn't even purchase an extra battery for it at release time in June. This made me a little nervous with a client shoot coming up, but I pulled the trigger and hoped for the best. The landscape for sub-$1,000 cameras that can shoot decent quality is remarkably thin, and even though GoPro's touted its Fusion as the best camera in this space, it’s nowhere to be found at press time and the Garmin shoots higher resolution anyway (5.7K versus 5.2K). You can also shoot lower resolution 5K, 4K, or 3.5K. All of the modes are 30 fps except for the 3.5K, which is 60 fps. At this price point, few options (other than perhaps the Vuze 4K 3D 360 camera) that use more than two lenses exist. The Garmin fits the mold of most other consumer/prosumer cameras, using two sensors and lenses sandwiched back to back to form a 360-degree image. The camera also shoots on Micro SD cards. So what’s it like shooting with the Garmin? Wonderful and frustrating at the same time. Let’s start with the good stuff. Besides the higher resolution, the Garmin features a bevy of sensors to measure things such as speed, altitude, distance, and location. It’s the company playing to its obvious strengths. Measuring all of that stuff requires a lot of battery power, and so thankfully the battery is replaceable with just a quick removal of the tripod mount (or the also-included GoPro mount) to access the battery compartment. The camera features plenty of buttons and a screen to change settings right on the camera without the need for an app. There’s even a handy sliding switch to turn on video, not a bad idea compared to a button that’s easy to accidentally hit. Many manufacturers are eliminating screens and controls from their cameras, and so it’s refreshing to see this degree of control without needing to eat up phone batteries. That said, if you want more advanced settings or to preview your footage or photos before shooting, you’ll need the Garmin VIRB app. 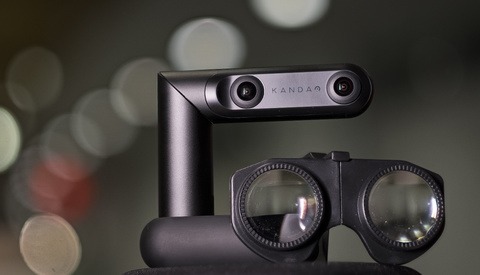 A refreshing amount of buttons, switches and screens to work with directly on the camera. No app necessary. The app itself is smooth and easy to use, at least the iOS version I tried on my iPhone 6s. Once you connect the first time, it will automatically find the camera later and you have a lot of professional controls at your fingertips to control exposure. The one thing I wished for was the ability for raw photo capture to a DNG file, but at least you have the option for a flat color profile for the JPG file. I was able to live stream to Facebook on the first try (the resolution on live streams is a low 1280x720, which looks even worse in 360 degrees, but that the camera is able to do this is at all is a big step up from its nearest competitor, the Nikon KeyMission 360). That the app was this polished from day one is a big deal when the rest of the industry is pushing a release-first, patch-later model. Sadly this polish did not extend to Garmin’s VIRB Edit desktop software, which was incomplete at launch and still crash-prone today. Like many other 360-degree cameras on the market, it’s a first-generation product right now. Some weirdness is expected. But what came out of the box for the first VIRB 360 I had (yes, I’m on number two) was something that almost cost me a shoot. One of the marketing claims of the camera is that it can “constantly record for more than one hour on one charge — without overheating.” It’s odd that this would make it into the marketing materials when in my experience it hasn't been true. The first camera got so hot in the middle of 10 minutes of shooting that footage was corrupted on the card. At Garmin’s suggestion, I tried another card with the same results. I had to place the camera in a refrigerator in the middle of the shoot to get it back down to operating temperatures where everything worked again. To the company’s credit, Garmin sent me a new unit without much trouble, and while it seems to run a bit cooler now, it also seems to produce a corrupted JPG file every few shots, which is especially frustrating when trying to manually bracket shots through the app. There seems to be no rhyme or reason to the bugs, and it’s concerning to see two completely different problems across two models. VIRB Edit is Garmin’s suite of editing software, and it’s what you use to stitch 5.7K video, which only comes out of the camera unstitched. That is, it’s what you use to stitch 5.7K video if you’re a PC user. At press time, the Mac version of the software can’t stitch the higher resolution. Let that sink in for a little bit. Six months after the camera’s release and there’s still no way to edit 5.7K footage from the manufacturer if you’re a Mac user. PC users didn't get the option until a September software update. If you’re going to tout resolution as a headline feature of a camera, it would make sense to have stitching software available at launch. Sounds reasonable to me. Also reasonable is software that doesn't crash if you look at it funny. While the Garmin tech support people were as helpful as they could be, updating drivers and disabling devices didn't solve the repeated crashing problems when trying to edit the software. I used it for stitching and then moved files over to Adobe Premiere Pro for editing, which unfortunately causes me to miss out on some of the features of the Garmin software such as stabilization and overlays for the positioning data that was collected with the footage. But How Does It Function? Once you get past the software limitations and the occasional hardware glitch, you get to see the true potential of the camera. Video footage looks great at 4K stitched-in camera. 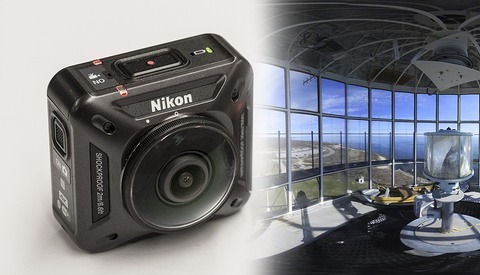 It seems to display more dynamic range and a clearer image than its nearest competitor, the Nikon KeyMission 360’s output. The 5.7K footage looks even sharper, and while it takes roughly 15 minutes to stitch a 1 minute file (on a computer powered by an Intel Core i5 processor and 16 GB of memory), it’s worth the wait, and the weight of the file. There are options for creating time-lapses and using only one of the lenses for a super-wide-angle shot, though at that point I’d just reach for a regular camera. The 15-megapixel photos are another story; no matter what settings you fiddle with on the “pro mode” or even on auto, noise reduction algorithms smear away all of the fine details. 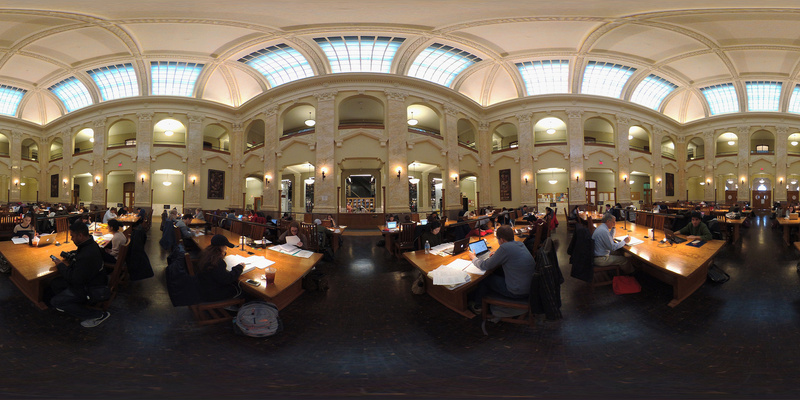 When you look at the 360 photos produced by a VIRB 360 on a large monitor, you’ll be disappointed by the overly painter-like qualities of the image, much like a cell phone photo. Text especially is hard to make out on this camera. 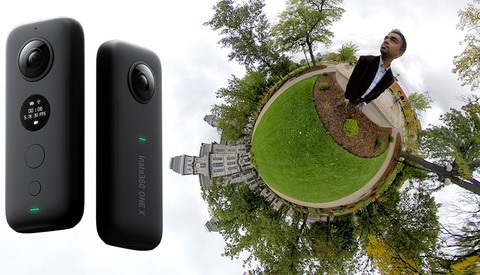 If photos are your primary 360 purpose, I’d strongly suggest looking at another camera. An image straight from the Garmin VIRB 360. Details just really aren't there, especially when viewed as a 360 image (vs. the equirectangular version here). Buttons and a screen to change settings right on the camera. In-camera stitching for video (though not at the highest resolution). Useful and polished iOS app. 5.7K resolution is higher than other cameras in its class. Comes with a high-quality mini tripod and both tripod and GoPro mounts. Limited ways to stitch 5.7K footage. Buggy hardware and desktop software. No included charger, just a cable. For under $1,000, the Garmin is the best 360-degree video camera you can get. While the GoPro Fusion gets all of the ink (pixels?) in this class of cameras, don’t get blinded by the name. The Garmin is every bit a contender, and you can buy it now instead of waiting for it to be released. That’s several months of use you’ll get out of this camera which will still likely produce a sharper image because of the higher resolution. That said, the photos are bad enough to give pause, and, especially if you’re a Mac user, the software might be a deal breaker. Ultimately, there aren't a lot of players in the high-end consumer 360-degree camera market. 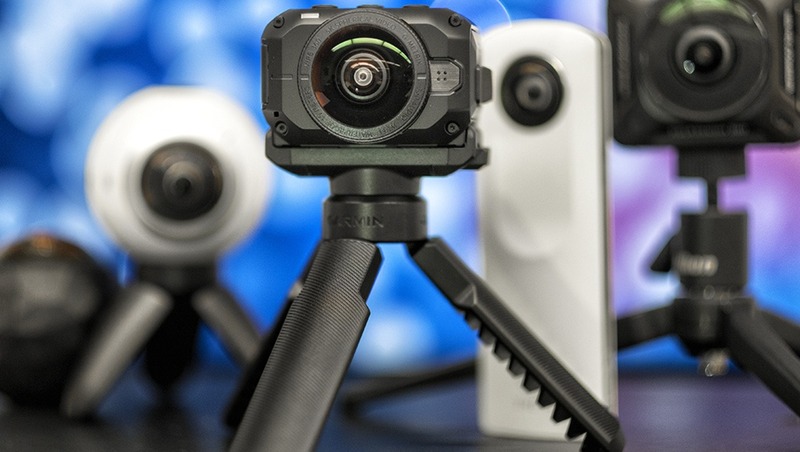 Up until the just-released Theta V, Ricoh wasn't even close in video resolution, the Samsung Gear 360 cameras aren't really in the same class, and the Nikon KeyMission 360 is growing a bit long in the tooth. That puts the Garmin VIRB 360 at best-in-class status, with the caveat that it’s a pretty small class at the moment.